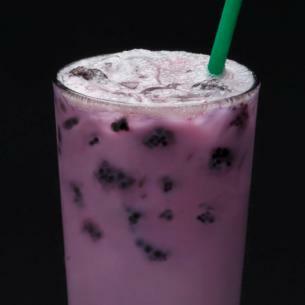 The sweet blackberries and tart hibiscus of our Very Berry Hibiscus Starbucks Refreshers™ Beverage swirl together with creamy coconutmilk and ice, creating refreshing (and violet-hued!) sips. ICE, BERRY REFRESHER BASE [WATER, SUGAR, WHITE GRAPE JUICE CONCENTRATE, NATURAL FLAVOR, GREEN COFFEE EXTRACT, CITRIC ACID, ERYTHRITOL, ASCORBIC ACID (VITAMIN C), REBAUDISIDE A], COCONUT MILK [WATER, COCONUT CREAM, CANE SUGAR, TRICALCIUM PHOSPHATE, COCONUT WATER CONCENTRATE, NATURAL FLAVORS, SEA SALT, CARRAGEENAN, GELLAN GUM, CORN DEXTRIN, XANTHAN GUM, GUAR GUM, VITAMIN A PALMITATE, VITAMIN D2 (ERGOCALCIFEROL)], FREEZE-DRIED BLACKBERRIES.